Author(s): Mathilde Cheray, Romain Pacaud, Eric Hervouet, Francois M. Vallette, Pierre-Francois Cartron. Institut de Recherche en Sante INSERM U892 – CRCNA, Equipe 9 –Apoptose et Progression tumorale, 8 Quai Moncousu, BP 70721, 44007 Nantes Cedex 1 France. DNA methylation, catalyzed by DNA methyltransferases (DNMT), is a major epigenetic modification that modulates gene expression. DNMT inhibition is a current challenge in cancer therapy because of inhibition of tumor suppressor genes (TSG) by hypermethylation. Since the apparition of the first DNMT inhibitors, many global (inhibitors targeting all the DNMT) and specific DNMT inhibitors have been developed. Unfortunately, the main problem of these inhibitors is the global effect induced on DNA methylation leading to hypomethylation of tumor suppressor genes but also oncogenes (and therefore activation/re-expression of them). In this review, DNMT, their implication in cancer development and progression and their different inhibitors (including mode of action, benefits and limits) will be discussed. Thus, a new specific methylation inhibition approach will be described. This approach aims to specifically reactivate tumor suppressor genes without activation of oncogenes by disruption of selective DNMT-including complexes leading to a targeted hypomethylation. Keywords: Cancer, DNA methylation, DNMT, DNMT inhibitor, epigenetic, therapy. Affiliation:Institut de Recherche en Sante INSERM U892 – CRCNA, Equipe 9 –Apoptose et Progression tumorale, 8 Quai Moncousu, BP 70721, 44007 Nantes Cedex 1 France. Keywords:Cancer, DNA methylation, DNMT, DNMT inhibitor, epigenetic, therapy. Abstract:DNA methylation, catalyzed by DNA methyltransferases (DNMT), is a major epigenetic modification that modulates gene expression. 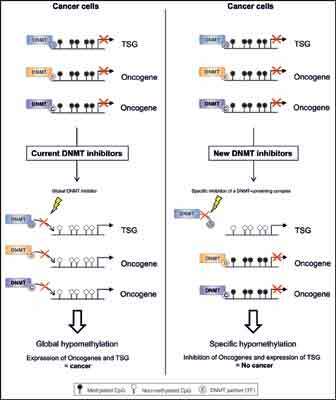 DNMT inhibition is a current challenge in cancer therapy because of inhibition of tumor suppressor genes (TSG) by hypermethylation. Since the apparition of the first DNMT inhibitors, many global (inhibitors targeting all the DNMT) and specific DNMT inhibitors have been developed. Unfortunately, the main problem of these inhibitors is the global effect induced on DNA methylation leading to hypomethylation of tumor suppressor genes but also oncogenes (and therefore activation/re-expression of them). In this review, DNMT, their implication in cancer development and progression and their different inhibitors (including mode of action, benefits and limits) will be discussed. Thus, a new specific methylation inhibition approach will be described. This approach aims to specifically reactivate tumor suppressor genes without activation of oncogenes by disruption of selective DNMT-including complexes leading to a targeted hypomethylation.